Our queen of buttercreams has a new version. A couple of days ago, Jean asked on our Ask a Question page if the neoclassic method used for the neoclassic buttercream could also be implemented for the mousseline buttercream. This method eliminated the need for a temperature reading by replacing the sugar and water mixture with a sugar and corn syrup mixture. When the mixture reaches a full boil it automatically is the perfect temperature for heating the egg yolks. I first offered neoclassic buttercream in The Cake Bible 30 years ago and in the years following, I had not found a favorable result using the same method for Italian meringue. But when testing recipes for Rose’s Baking Basics I was inspired to revisit the technique, altering the ratio of sugar to corn syrup and it worked. Thanks to Jean’s request we decided to give the new neoclassic Italian meringue a try for the mousseline and after two tests: Eureka! To prevent the mousseline from becoming curdled, the temperature range for combining the butter and egg white meringue is a couple of degrees higher than for my classic mousseline. This is because it uses less egg white for more strength, and also, while the temperate of the syrup is close to that of the classic one, it is a little lower and therefore a little less stable. Also, we found it beneficial to increase the amount of sugar and corn syrup slightly, compared to the new neoclassic Italian meringue because this also increases stability needed for incorporating butter into it. * 30 minutes to 1 hour ahead, set the butter on the counter at cool room temperature. The butter needs to be 65˚ to 68˚F/19˚ to 20˚C. * 30 minutes to 1 hour ahead, in a small bowl, weigh or measure the egg whites, and add the cream of tartar. Cover with plastic wrap. * Have ready a 1 cup/237 ml glass measure with a spout by the cooktop. 1) In the bowl of a stand mixer fitted with the flat beater, beat the butter on medium-high speed until creamy, about 1 minute. Set it aside in a cool place (no higher than 70˚F/21˚C). 3) With a handheld mixer, beat the egg whites and cream of tartar on medium-low speed until foamy. Raise the speed to high and beat until stiff peaks form when the beater is raised slowly. 4) Increase the heat until the sugar and corn syrup has reached a rolling boil with the surface covered with large bubbles. Immediately pour the syrup into the glass measure to stop the cooking. 5) Beat the syrup into the egg whites in a steady stream. Don't allow the syrup to fall on the beaters or they will spin it onto the sides of the bowl. Use a silicone scraper to remove the syrup clinging to the measure and scrape it onto the bottoms of the beaters. 6) Lower the speed to medium and continue beating for up to two minutes. Refrigerate the meringue for 5 to 10 minutes, until 72˚F/23˚C. Whisk it after the first 5 minutes to test and equalize the temperature. 7) Set the mixer bowl containing the butter in the stand and attach the whisk beater. Beat the butter on medium-high speed for about 3 minutes, or until it lightens in color and is between 70˚F/21˚C and 72˚F/23˚C. 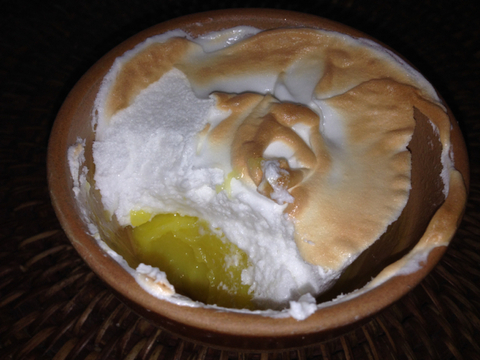 8) Confirm that both the creamed butter and the meringue are both within 2 degrees of each other. Scrape the meringue into the butter and beat on medium speed until smooth and creamy. Beat for about 2 minutes, scraping down the sides of the bowl as necessary. At first the mixture will look slightly curdled. Continue beating until it becomes a uniform, creamy texture. If it starts watering out or continues to be curdled, check the temperature. It should feel cool and be no lower than 70˚F/21˚C, no higher than 73˚F/23˚C. If too warm, set it in a bowl of ice water, stirring gently to chill it down before continuing to beat the buttercream by hand until smooth. If in doubt, it is best to remove a small amount and try beating it either chilling or heating it slightly. If too cool, suspend the bowl over a pan of very hot water (do not let the bottom of the bowl touch the water) and heat for just a few seconds, stirring vigorously when the mixture just starts to melt slightly at the edges. Dip the bottom of the bowl in a larger bowl of ice water for a few seconds to cool it. Remove the bowl from the ice water and beat the buttercream by hand until smooth. If the mixture breaks down and will not come together, it can still be rescued. See our posting: When Tragedy Strikes Your Mousseline Buttercream. 9) Gradually beat in the vanilla and optional liqueur. Store Airtight: room temperature, 1 day; refrigerated, 3 days; frozen, 2 months. * High fat butter is a great help for decreasing any initial curdling of the mousseline. * It is best to avoid making meringue on humid days. * The mixer bowl and beater must be entirely free of any fat, which includes oil or egg yolk. * If doubling the recipe it’s fine to use a stand mixer for the egg whites if you have a second bowl. Add the heated sugar and corn syrup mixture in 3 parts with the mixer off. Then beat each part for several seconds and scrape the sides of the bowl between each addition. Use a silicone spatula to remove the syrup clinging to the measure and scrape it onto the bottoms of the beater. When pouring, be sure to avoid letting the syrup hit the beaters so that it doesn’t spin it onto the sides of the bowl. * The mousseline becomes spongy and fluffy on standing which is lovely once on the cake. If you don’t use it right away, whisk it lightly by hand to maintain a silky texture before apply it to the cake. Do not, however, rebeat chilled mousseline until it has reached 72˚ to 74˚F/23˚C to prevent it from breaking down. I will always remember the first time I tasted mousse au chocolat. I remember that it was in France. I remember that I had lunch on my own and the direction I was facing in the restaurant was toward the front windows. But I don’t remember either where in France it was or the name of the restaurant. All I remember is that it was the best chocolate I had ever tasted and that I was so spellbound I had to ask the waitress for the secret to its flavor. Her answer: Madame c’est le chocolat! It seems obvious now, but in those days in the USA people used “baking” chocolate and not fine eating chocolate for desserts. So on my return home, I went to the lower east side to Essex Street Candy and purchased the best chocolate I knew of which was Lindt. The owner asked me what I was planning to use it for and when I said baking, he firmly informed me that it was “eating” chocolate. But you eat what you bake was my reply. Coincidentally, David Liederman had just put his chocolate chip cookies on the culinary map, in New York City, using the exact same chocolate cut into small pieces instead of chips. There was no going back. Recently I had a sudden craving for chocolate mousse and a desire to create the best one to suit my current taste and texture preferences. My goal was a mousse that would be silky-creamy and slightly airy, chocolaty but not overly intense and more on the bittersweet than milk chocolate spectrum. Valrhona le Noir Gastronomie (aka bittersweet) 61% cacao was my chocolate of choice, and of course there is always egg yolk and a little sugar to balance what would be either butter or heavy cream or sometimes both. My favorite chocolate mousse for years was one I created for Poulain chocolate, which used only heavy cream and optional Kahlua or Cognac but it was high in egg white and I now found it too airy. Julia’s classic version uses both butter and heavy cream, and liqueur. Both coffee and liqueur heighten the taste of chocolate, but this time I wanted only the pure taste of the best chocolate and maybe a touch of vanilla. I was undecided about the butter. I wanted the mousse to be fairly light and—well—moussey, and from my years of baking experience I’ve found that the more an ingredient is processed the more the flavor changes (i.e. butter starts off as cream and cream has a floral quality mostly lost in butter). I decided to consult my two favorite chocolate friends: Zach Townsend, chocolatier in Texas, and Lisa Yockelson (author of Chocolate Chocolate). They both, eloquently and precisely, put into words exactly what I was perceiving. Zach: With butter it's more pudding-ish. I like creamy and airy. So I chose a higher than usual proportion of cream to chocolate and a larger than usual amount of egg yolks. Heating the yolks with the chocolate and cream and then straining the mixture before folding in the stiffly beaten egg whites (see Notes), produced the silky texture of my dreams. Prep Ahead: Make the mousse 1 day up to 3 days before serving. * Separate the eggs, placing the yolks in a medium bowl and the one egg white in a mixing bowl. Lightly whisk the yolks and leave the whisk in place. * Chop the chocolate into small pieces and set it in a small saucepan. Have a fine strainer ready near the range, suspended over a medium mixing bowl. 1) Add the cream to the chocolate, and heat on low heat, stirring constantly, until the chocolate has melted and the mixture is hot (about 120˚F/49˚C). 2) Whisk a few tablespoons of the hot chocolate mixture into the yolks. Then add the yolk mixture back into the chocolate mixture in the pan, stirring constantly. 3) Continue stirring on very low heat, just until it starts to thicken. An instant-read thermometer should register 160˚F/82˚C. 4) Immediately remove the pan from the heat and pour the mixture into the strainer, scraping up the thickened cream that settles on the bottom of the pan. Press it through the strainer and scrape any mixture from the bottom of the strainer. Stir in the vanilla. 5) Press a piece of plastic wrap directly on the surface to keep a skin from forming. Set the bowl on a rack and allow the mixture to cool to room temperature (about 1-1/2 hours). 6) In a medium bowl, beat the egg white and cream of tartar on medium-low speed until foamy. Gradually raise the speed to medium-high and beat until soft peaks form when the beater is raised. Gradually beat in the sugar until glossy curved peaks form when the beater is raised. Use a whisk to fold the meringue into the chocolate mixture. Finish with a large silicone spatula, reaching to the bottom of the bowl. Spoon the mixture into the ramekins. 7) Cover each ramekin tightly with plastic wrap, stretching it across to keep it from touching the smooth surface of the mousse. Refrigerate for a minimum of 8 hours up to 3 days. Sugar is a personal taste and more can be added if you prefer less bittersweet. Using the proper amount of cream of tartar makes it possible to beat the egg white to stiff consistency without breaking them down. For the immune impaired, the very young, or the very old, I recommend using pasteurized eggs such as Safest Choice. You will need to use double the cream of tartar and beat longer for the egg white but they produce an extra stable meringue. If your cooktop does not have a very low heat setting, it's best to use a double boiler. To make Pot de Crème, which is a more intense and denser chocolate dessert, omit the egg white (and cream of tartar) and use only 2-1/2 to 3 egg yolks (45 grams). When you store things, always label, always label, always label!!! I found a mystery jar in the fridge of what appeared to be caramel. It also smelled like caramel and even tasted like caramel but with something wonderfully extra that I couldn’t define. Cursing myself for once again not bothering to label the jar, thinking there was no way I wouldn’t forget what it was, and having proven myself wrong yet again, I was determined to figure it out. For one thing, how could caramel have stayed fluid and un-crystallized for so many months? I needed to know. I had made the Gâteau à l’Orange the day before and something told me that not only would the ‘caramel’ not overwhelm the orange flavor, it might even enhance it. I drizzled some of the glaze on top of a slice and a marvelous synergy took place. Not only is the sauce slightly orange in color, its texture and flavor are perfect with the cake. I started going through all the many recipes of the past year that might have used some form of caramel and eureka! It wasn’t really caramel, it was the Butterscotch Toffee Sauce from the Sticky Toffee Pudding in Rose’s Heavenly Cakes that I made 5 months ago! Yes: that mystery flavor was butterscotch from the dark brown Muscovado sugar and the slight tang from the molasses it contains plus the lemon juice which also served to maintain it’s creamy texture even after several trips to the microwave to soften it for lacing on top of the remaining slices of cake. This recipe is so easy to make, requiring no temperature taking. It will also be in the upcoming ice cream book, but for those of you who are about to make the Gâteau, I don’t want to make you wait another minute or til 2020 if you don’t have Heavenly Cakes! * About 30 minutes ahead, cut the butter into a few pieces and set it on the counter at room temperature (65˚ to 75˚F/19˚ to 23˚C). 1) In a small saucepan place the sugar and vanilla bean. Scrape the vanilla bean seeds into the sugar and rub them in with your fingers. Remove and reserve the pod. With a silicone spatula, stir in the butter. * Muscovado sugar from India Tree gives the best flavor. * You can replace the vanilla bean with 1 teaspoon of pure vanilla extract, stirred in after the glaze is no longer hot. I have a long history with microwave cooking. In the 1970's, when I was a student at NYU, one of my assignments was to develop recipes for their one microwave oven which dated back to World War II. A few years later, Elizabeth Alston, who was the food editor of Redbook Magazine asked me if I would like to do a freelance story on microwave cooking. I declined, saying it doesn't do everything well to which she said: Good! Then do only what it does do well! (I have admired her ever since and had a great time working on the recipes with a nutritionist, Gail Becker, who did the nutritional analysis. The upshot was that we were so taken with microwave cooking, we decided to start a cooking school specializing in it. I put in a call to Mimi Sheraton, who at the time was writing about cooking schools for the New York Times. She asked me when the school was starting and my response was: "When will you be writing about it." She informed me that the New York Times would never stand behind microwave ovens as they were dangerous and, as the wife of a radiologist, how could I consider such a thing. (This was before Barbara Kafka had her weekly microwave column for the New York Times--lesson: never say never.) I explained to Mimi that because my husband was a radiologist I knew that there are two different types of rays, and the one that is used in microwaves is on the same wave length as that of radios. I'm not sure if she was convinced, but somehow the microwave school never happened. A short time later, NYU lost their microwave teacher who told me that she was tired of academia and was going into industry. They begged me to teach the class and I agreed as long as I didn't have to grade exams. It turned out to be a great opportunity to explore recipes conducive to microwave cooking, and I even took the class on a field trip to the Sharp corporation in NJ to try out their microwave/convection oven. Out of all the recipes that were created in that class, there is one that stands above the rest as the most enlightening, so I'm going to share it with you here and I hope you will be inspired to try it. I wish I had the name of the student who created it as she did a splendid job adapting the recipe and writing it up as is presented in her words here. It is for a classic french dessert, Poires Belle Helène and perfect for this time of year when pears are at their finest. Microwave Method The lemon was placed in the microwave oven for 20 seconds to help prevent the peeled pears from browning. The wine, cloves, cinnamon, sugar, and lemon zests were heated on high, covered, for 2 minutes. The pears were added with the stems turned inward, covered with saran wrap and vented. They were cooked on 70% power for 12 minutes. They were turned over half way through the cooking process. They were then cooled and chilled in the syrup overnight. *(The cooking liquid in the poaching of the pears and the chocolate sauce was reduced slightly to compensate for the food density.) The chocolate sauce was prepared by combining the chocolate bits and the cream in a glass dish. They were covered and vented and placed in the mw for 2 minutes at 100% power, and stirred once halfway through. The sugar and salt were added, recovered, and vented. They were microwaved at 100% power for 1-1/2 minutes (stirred halfway through the cooking process). The butter and vanilla were stirred into the sauce. The pears were removed from the syrup and dried gently with a paper towel. The bottoms were trimmed to allow the pears to sit upright. The cooled chocolate sauce was then spooned over the pears. The recipe for the chocolate sauce was repeated in a microwave oven with a variety of power settings. The chocolate and cream were combined in a glass dish, covered and vented, and cooked at 50% for 2-1/2 minutes (stirred once halfway through). The remainder of the recipe remained unchanged. Conventional Method The pears were peeled and dropped into cold water with the lemon juice. The wine, cinnamon, cloves, sugar, lemon zest were heated until the sugar dissolved. The pears were added and simmered--partially covered--until tender--55 minutes. They were then cooled and chilled overnight. The sauce was prepared by combining the chocolate and cream in a double boiler. They were stirred over low heat until the chocolate melted. The sugar and salt were added and cooked another five minutes. The butter and vanilla were then stirred into the mixture. The pears were removed from the syrup and dried gently with a paper towel. The bottoms were trimmed to allow the pears to sit upright. The cooled chocolate sauce was then spooned over the pears. 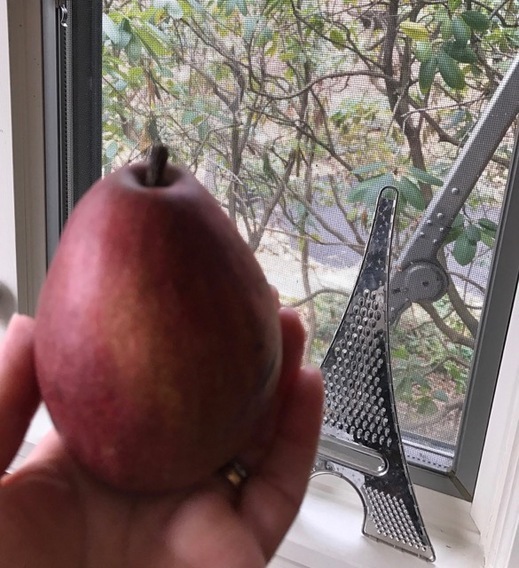 Conclusions: The conventionally prepared pears were not quite as tender as they should have been; and possibly could have been poached longer. Therefore, after cooking the pears for 55 minutes, the taste was similar to an unripe pear. The chocolate sauce was thick and rich with an appropriately creamy consistency and glossy finish. The pears poached in the microwave were uniformly cooked, tender, and sweet after 12 minutes in the microwave. The first chocolate sauce prepared in the microwave did not fare quite as well. It was a thin and runny chocolate sauce with a grainy texture due to overcooking. However, when the same recipe was repeated at 50% power (2-1/2 minutes) the result was similar to the conventionally prepared chocolate sauce. Ice Cream is my favorite dessert and I have developed many delicious variations from peanut butter to passion fruit ( The Pie and Pastry Bible ). Thus far, however strawberry ice cream perfection has eluded me as the high water content of the berries results in frozen particles rather than 100 perfect creamy smoothness. I have an idea, though, and testing it will be very enjoyable. But meantime I want to share with you a terrific way to enhance the flavor of any strawberry ice cream. And until I perfect my own version, my commercial strawberry ice cream of choice is Hagendaz. 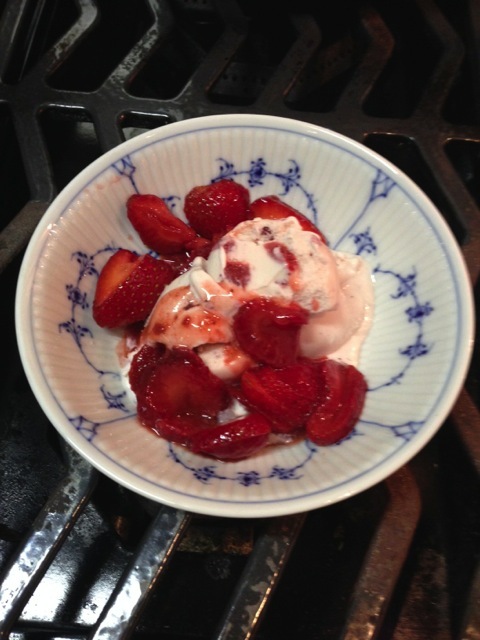 Adding fresh strawberries as an accompaniment to the ice cream is the ultimate flavor enhancer. The berries don't need to be at their very best as macerating them for a few hours in sugar greatly brings out their flavor, turns them brighter red, and forms a light syrup. Simply hull and slice the berries. Sprinkle them lightly with fresh lemon juice and sugar to taste. Toss gently to coat the berries. Cover with plastic wrap and allow them to sit for a minimum of 2 hours at room temperature and up to 2 days in the refrigerator. (Note: as an alternative to lemon juice, try a light sprinkling of rose water. There is something about strawberries and rosewater that is pure magic!) When serving the ice cream, spoon some of the berries and syrup on top. Note: I like to give ice cream a 9 to 15 second zap in the microwave on high power to ensure that it is creamy and not rock hard. 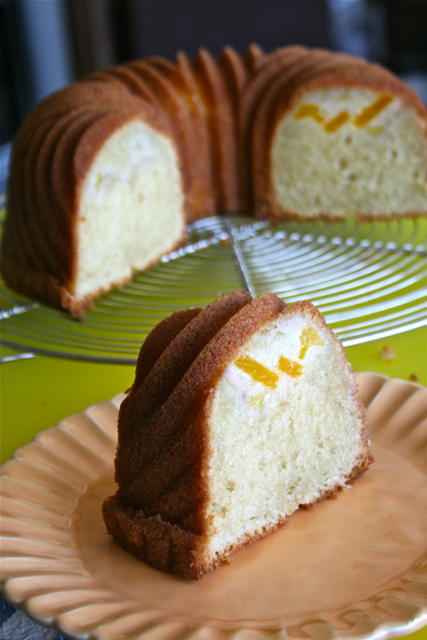 i am submitting my second ecookbook to the itunes store, and it will be BUNDT CAKES with everything that is baked on a bundt pan! cake, ice cream, lasagna, savory, always with twists and reasons. my ecookbooks will continue to sell for $8.99 and contain a dozen recipes. a new feature i am exited to include is include what the readers want. the book will be launched with only a handful of recipes and the rest will be added by the readers requests. i will add more recipes as my readers place comments on my facebook and instagram sites. yes, because it is an ebook, the moment i add more pages, you will be able to download the updated book, just like an app update, automatically without paying again. "measure in grams, it is faster and foolproof accurate. gram kitchen scales are sold everywhere and are super easy to learn." 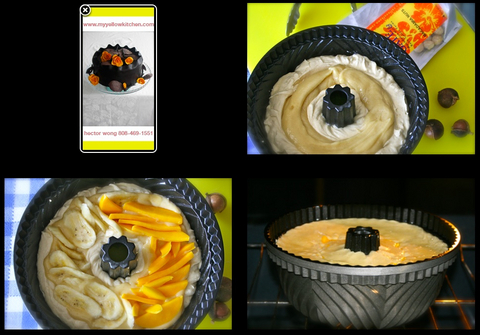 Cake pan: a bundt pan of 10 cup capacity, greased with baking spray with flour. makes 500 g (about 2 cups). this cake needs 250 g (about 1 cup). "My favorite macadamia nuts is from Lions Gate Farms. My favorite vanilla is from Hawaiian Vanilla Company." With a food processor, pulse the macadamia nuts with a third of the sugar, until the consistency of fine paste. Gradually, add and pulse the rest of the ingredients, in order as listed. With a bowl, combine all ingredients. Set aside, covered. With a stand mixer, beat the dry ingredients until uniform, 1 minute at low speed. Add the butter and half of the sour cream. Beat until incorporated, about 2 minutes at low speed. Add the rest of the ingredients gradually, in order as listed. Beat until smooth, about 2 minutes at medium speed. Fill the cake pan. Spread the macadamia cream on the surface, forming a ring. . Lay the mango banana topping on top of the macadamia cream. Bake at 350˚F, until the cake reaches 190˚F, about 55 minutes. Notes: Instead of mangoes and bananas, use mangoes only, or any other firm fruit combination of your choice. The macadamia cream is exquisite, but this cakes also works without it. Left over macadamia cream can be cooked on low heat and used as a spread or filling for cookies or bread. @copyright hector wong and my yellow kitchen. When making lemon meringue filling for a pie, as I described in a previous recent posting, it is essential that the egg yolks reach the proper temperature to ensure that the mixture will not thin out on cooling. If not using a thermometer, it is safest to bring the mixture to just before it starts to boil. If it should lump, press it through a fine sieve. For the smoothest, silkiest filling, I now prefer to omit lemon zest and bring the filling to 170° to 180˚F/77 to 82°C on an instant read thermometer. These changes have been made on the posting. Make the Filling: In a small bowl, lightly whisk the egg yolks. In a heavy nonreactive saucepan, (don't use double boiler as it won't boil and won't be thick enough), combine the cornstarch and sugar and gradually whisk in the water until smooth. Cook over low heat, stirring constantly with the whisk until thick, smooth and translucent, about 5 minutes. (A thermometer will register 190°F/88°.) Whisk a few spoonfuls of this hot mixture into the egg yolks and then add the yolks to the remaining mixture, whisking constantly. Check the temperature. An instant read thermometer should read 170° to 180˚F/77 to 82°C. If it is lower, return the mixture to the heat and cook, whisking constantly, until it reaches temperature. Remove it from the heat and whisk in the salt, lemon juice, and butter until the mixture is smooth. Scrape it into the ramekins. Cover with plastic wrap to keep hot so that the bottom of the meringue sets. Note: It is essential that the egg yolks reach the proper temperature to ensure that the mixture will not thin out on cooling. If not using a thermometer, it is safest to bring the mixture to just before it starts to boil. If it should lump, press it through a fine sieve. Immediately pour the syrup into the glass measure to stop the cooking. If using an electric hand-held mixer, beat the syrup into the whites in a steady stream, avoiding the beaters to keep the syrup from spinning onto the sides of the bowl. If using a stand mixer, pour a small amount of syrup over the whites with the mixer off. Immediately beat at high speed for 5 seconds. Stop the mixer and add a larger amount of syrup. Beat at high speed for 5 seconds. Continue with the remaining syrup. With the last addition use a rubber scraper to remove the syrup clinging to the measure. Continue beating on high speed for about 2 minutes or until the outside of the bowl is no longer too hot to touch comfortably. 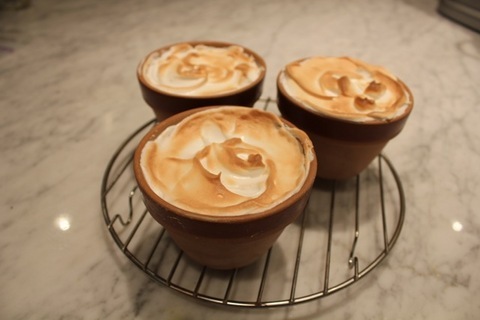 Spread the meringue on top of the filling, starting from the edge of the ramekin. Use a small metal spatula to make attractive swirls and peaks. If desired, for extra crunch, dust the meringue with powdered sugar. Bake the pie for 5 minutes. Then turn the oven to broil and brown the meringue for 20 seconds to 1 minute, watching carefully to prevent burning, until the meringue is golden. Cool in a place away from draughts and refrigerate for 2-1/2 to 3 hours. Serve chilled. Store: Uncovered: Refrigerated, 1 day to 2 days. Note The cornstarch protects the egg yolks from curdling but if overheated, and they become slightly lumpy, it is fine to pass the mixture through a fine strainer which will return them to a perfectly silky consistency. When people ask me about recipes for vegan baking, which is not my area of expertise, I direct them to my good friend and colleague Fran Costigan, known as "the Queen of Vegan Desserts http://www.francostigan.com. I have known Fran for many years and have great respect for her integrity as an expert in the subject, as a teacher, and as an author. When the book arrived, I was struck by large number of gorgeous photos and delighted by the way in which the ingredients are listed in both volume, grams, and milliliters. This, together with the detailed instructions, make it a pleasure for me to work from this book. All 120 recipes contained in this book are plant-based and some are gluten-free. 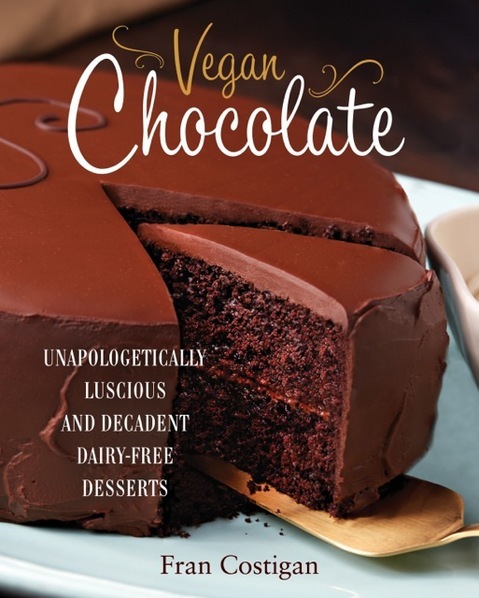 The luscious chocolate ganache glaze which graces the cake on the book's cover is made with almond milk and Fran has generously given me permission to post the recipe. It will take longer to read this recipe than to make it, but its success is all about the quality and taste of the chocolate and following the details in the recipe. As long as you stay within the percentages listed, any premium chocolate you enjoy eating is the one to use. The important part is to chop the chocolate very fine. Allowing the chocolate to melt into the milk for the full 4 minutes is not optional. And stir only until the chocolate and milk are emulsified--that is, glossy and smooth. Over-mixing may turn your silken ganache gritty. If the chocolate has not completely melted after the ganache is mixed, bring the water in the saucepan on the stove to a simmer and turn off the heat. Place the bowl of ganache on the saucepan for a few minutes, then stir very gently until the chocolate has melted and the ganache is smooth. 1. Add the chocolate to a heatproof bowl and set aside while you heat the milk. 2. Pour the milk into a small saucepan. Add the sugar and salt. Cook over medium heat, whisking a few times to a low boil. 3. Immediately remove the saucepan from the heat. Pour the hot milk over the chopped chocolate all at once. Rotate the bowl so the chocolate is completely submerged. Cover the bowl with a plate and let stand undisturbed for 4 minutes. 5.Keep the bowl of ganache at room temperature while you test the final consistency. Dip a teaspoon into the ganache, set the coated spoon on a small plate, and refrigerate for 10 to 15 minutes. After chilling, the ganache on the spoon should e smooth and firm, but should taste creamy. It is unlikely, but if the glaze is too firm, add a tablespoon of room temperature milk, and repeat the test. Add a second tablespoon if needed. 6. Pass the ganache through a strainer into a bowl. Whisking slowly will speed the process. 7. Allow the ganache to thicken at room temperature for 15 to 25 minutes, or until it will coat a spoon thickly with minimal dripping, but remains pourable. Stir a few times from the outside into the center before glazing. Bake from this book often and with pleasure. It will never fall apart as it has a stitched binding! Tira Misu is the ultimate comfort food. It is essentially a delicate Marsala egg custard, layered with lady fingers that have been dipped in a coffee syrup. It is one of life's perfect things. I was sad to learn that one of America's greatest restaurants, located in Chicago, is closing its doors this month. Charlie is a brilliant restaurateur, inspired chef, cookbook author, tv host, and loyal, generous friend. Chocolate is not my top favorite flavor unless it is wonderful. My first love is vanilla and then caramel, followed closely by lemon. So when I tell you that this is one of the most delicious things I've ever tasted--trust me! What is a more perfect combination than pork chops and apple sauce! The most delicious thing I tasted at the Beard Awards back in May was that delicious I went back for three more servings! It was presented by pastry chef Bill Corbett of Daniel Patterson's Coi Restaurant in S.F. He made a roasted white chocolate mousse, using a special new technique he had learned recently at a course at ValRhona in France. It is simply astonishing, yet not surprising, how the milk solids in the white chocolate, on roasting, caramelize and transmutate (yes I know there is no such word but there needs to be and there is now!) into such extraordinary flavor. Just think of the possibilities! Put the white chocolate chunks into a roasting pan. Roast in the oven for 40 to 50 minutes, stirring every 5 to 10 minutes. The chocolate will turn a golden caramel color. It will stiffen between stirrings but should become smooth as you stir it. Pour the roasted white chocolate out onto a silicone baking mat or wax paper and allow to set for 24 hours. Don't worry if the chocolate develops a mottled appearance (known as bloom). Break up the roasted chocolate into small pieces. Measure out 160g/5.6 ounces (about 1-1/3 cups) of the chocolate. Melt the 160g/5.6 ounces of chocolate with the canola oil in a bowl over boiling water. Mix in ½ teaspoon salt and the feuilletine. Spread on a silicone baking mat or wax paper and leave to set overnight. Place the remaining chocolate (about 300 g/10.6 ounces or 2-2/3 cups) in a medium bowl. Bring 1 cup of the cream to a boil in a small saucepan Pour the hot cream over the chocolate. Whisk until smooth. Add the remaining ½ teaspoon salt. Set aside to cool until thickened, at least 20 minutes. Whip the remaining cream (about 1-3/4 cups) in a stand mixer until it forms soft peaks. Fold 1/3 of the whipped cream into the chocolate mixture. Carefully fold the remaining whipped cream into the chocolate mixture. 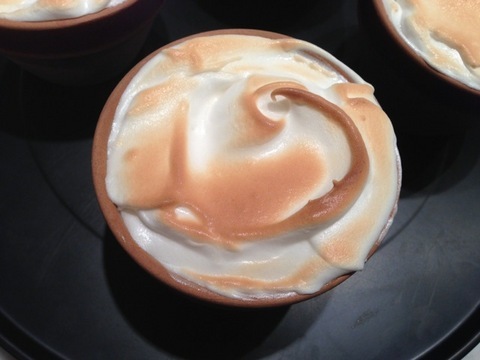 Divide the mousse between 4 to 6 ramekins or serving bowls. Refrigerate for at least 4 hours or overnight. To serve, break the chocolate feuilletine bark into small pieces and use to garnish the mousse. NOTE: Feuilletine is a crunchy, buttery flake that can be purchased at specialty baking stores or online. If you can't find it, substitute finely crumbled cigar wafer cookies. When we went to Beaver Creek this year we stayed at the Hyatt. And I looked forward to going to bed every night because by the pillow each night were two of the most exquisitely delicious candies imaginable: Enstrom's Almond Toffee--a milk chocolate version and a bittersweet version. The bittersweet worked perfectly as a foil to the sweet toffee but I loved the milk chocolate version as much so I carefully bit each one in half and then handed over the reluctantly uneaten halves to Elliott (even though they were both placed by my pillow) who seemed to be enjoying them as much as I was. 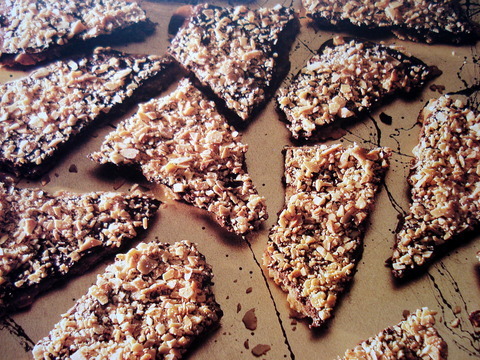 I had forgotten that my Mahogany Buttercrunch Toffee is one of people's favorite recipes in my Christmas cookie book. But toffee can be tricky. Just this week someone posted on the blog that the toffee tasted burnt. If you don't have an accurate thermometer don't even try making this recipe--just order it on line from Enstrom's or call 1-800-367-8766. They're beautifully packaged for gift giving. People are always saying they don't know what to give me. Try this! And if you're feeling adventurous, try mine on page 97 of Rose's Christmas Cookies pictured above. PS the recipe for the deluxe version, with chocolate on both sides, is now in The Baking Bible! Day 1 of our vacation in Hope, NJ started out with a bang: I spotted something unusual from the corner of my eye moving quickly through the brush. Suddenly it came out into the open and what I then perceived it to be was a huge bear walking around the garden. I calmly called 911 and was transferred to the local police who politely informed me that they “don’t do anything about bears.” They went on to assure me that if I don’t bother it, it won’t bother me (they didn’t realize that trampling the patience was indeed bothering me). Then Elliott pointed out that it was a baby bear and that it was now by the porch door. I went over to investigate and found that it was indeed a very sweet looking little bear, just a little larger than a large dog. It looked so friendly I started thinking “pet” but decided this would surely be a huge mistake. The only project I had planned for today was to pit the sour cherries I purchased yesterday at the Union Square farmer’s market because even with the stem still on they do deteriorate very quickly. But since I’m really really in need of a little break from my usual activities such as baking and blogging (I’m making an exception since the season is short and I want to share this exceptional discovery, I compromised by deciding to take my husband’s advice and cook the cherries as a pie filling without a crust to serve over ice cream (hence it’s name). We just got back from shopping for staples, one of which was ice cream to go with the cherries (yes I had to really speak sternly to myself to keep from whipping some up since I have all the necessary ingredients on hand. What really won me over to store bought was the fact that my several ice cream makers all need to have the containers chilled in the freezer for about 24 hours and I wasn’t willing to wait. So we bought Edy’s “light, slow churned caramel delight,“ and Haagendazs’s vanilla bean, which my friend Marko rightly had just highly recommended . Both are excellent, of course the vanilla bean better with the cherries but we wanted to try the Edy’s we’d been hearing so much about. It is truly creamy and fantastic—bravo Edy’s for putting there knowledge of science before profit. I’ll be in the long run their profit will increase! Use my recipe one posting down for the cherry pie (filling) but decrease the cornstarch to 1 tablespoon. (If your too lazy to look, it’s 20 ounces (3 1/2 cups) pitted cherries: 6 ounces (3/4 cup + 2 tablespoons sugar and 1/4 teaspoon pure almond extract. Let the pitted cherries sit with the sugar and cornstarch for a minimum of 15 minutes (up to about 2 hours), until the sugar mixture is moistened and a syrup starts to form. Bring the cherry mixture to a boil on medium-low heat, stirring constantly but gently so as not to break up the cherries. Raise the heat to medium-high and boil for about 10 minutes or until the liquid and cherries are bright red and the juices thickened but still possible to pour off the spoon. Remove the pan from the heat and gently stir in the almond extract (it makes the cherries taste cherrier). Allow the mixture to cool a little or use it at room temperature to spoon atop your favorite ice cream. Bliss! By the way, don’t hold me to my word about not blogging any more during vacation—there are a few postings and a few responses to questions I intend to do, but do try to hold off with any more questions til july 12! Meantime I’ll need most of my will-power to keep from eating all of that fabulous pice cream in one sitting! of all the substances, liquid and solid, that pass through the portals of my lips, coffee is the most sacred, i.e. the last one i willingly would relinquish. the funny thing is i'm not even affected by caffeine. i can drink a cup of coffee and go straight to sleep. so i don't consider my love of coffee an addiction but rather a passion. it started when i was only 3 years old and went shopping with my grandmother. in those days supermarkets ground the coffee beans right at the checkout counter so even if she wasn't buying coffee that day someone was and i was guaranteed a whiff of the most delicious aroma i had every experienced. i wasn't allowed to drink coffee at that age except for a rare exception was when my mother would pour a little milk into the tiny cream pitchers used in those days to hold the top cream from unhomoginized milk. then, to my great joy, she would add a half eye- dropper full of freshly brewed coffee. bliss. i also loved watching and smelling the coffee percolating in the aluminum pot on the stove top. i started drinking coffee when i went away to college. but it was a bit of a disappointment because after all those years of expectation, the delicious aroma i had smelled was never present fully in the flavor. the mystery was revealed one day in a food course when the professor talked about the concept of volatile oils. she explained that the coffee aromas were carried in the oils of the coffee bean and that what i was smelling was these wonderful aromas that were virtually flying away from the brewing coffee and disappearing into the air. in fact, she said that percolating coffee was the worst possible thing one could do because more and more aromas were evaporating while the coffee was passing through the grounds repeatedly extracting bitterness. it was as if a light-bulb went off in my head. from that moment it became my goal to find a way to keep the precious aroma IN the coffee. to this effect i went through many coffee pots during my first marriage. when i discovered the melitta little porcelain drip pot i knew this would be the closest thing to perfection but my former husband told me that though he had been planning to give it to me for christmas that year, somehow he couldn't bring himself to do it because he felt it was just too "sick." o.k. i had already tried to no avail an aluminum drip pot, an electric percolator and even an electric vacuum coffee maker that sounded like 12 snoring dogs. but i wasn't willing to give up so why was he? right after the divorce i bought the melitta. and i had been right--the drip system and non-reactive porcelain was as close to perfection as i had hoped. panna cotta is a custard thickened with a little gelatin rather than the usual egg. 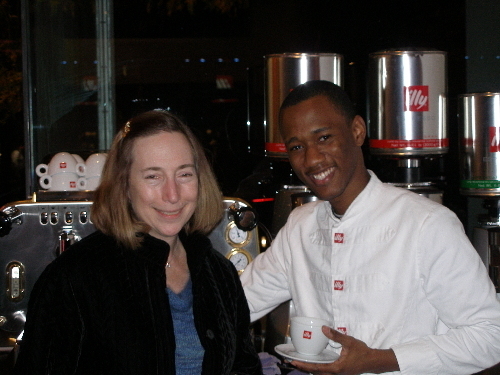 i suggested serving it in the exquisite illy espresso cup collection, garnished with a coffee bean. this 5 ingredient dessert is the soul of simplicity, easy to make, yet one of the most deliciously satisfying desserts in the world. it is like eating ice cream that isn't frozen yet holds its perfectly creamy consistency. excellence of flavor depends entirely on the quality of the coffee used to prepare it. here's the recipe in case you don't get a chance to visit the galleria, or in case you want to make it part of your own permanent collection. in a 4 cup microwave-safe measure or small saucepan, stir together the cream, sugar, and coffee. sprinkle gelatin on top and allow to sit for at least 3 minutes. stir in gelatin and microwave or heat, stirring constantly, just until bubbles form around edge. pour liquid through fine strainer or strainer lined with cheesecloth. stir in vanilla and pour into espresso cups. cover tightly and chill until set, at least 2 hours. garnish with coffee beans or chocolate coffee beans.